Rooms can be combined to seat 72. 4:30pm-8pmFreeOne child 10 & under per paying adult. Lunch: $9.48Dinner/Weekend: $11.37Must be 65 years or older. Cannot be combined with other offers. Treat yourself and your crew to a legendary experience in Sun Prairie. 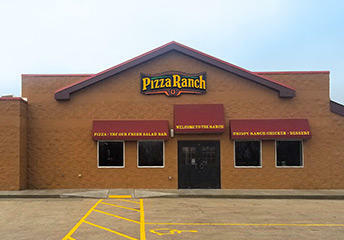 Pizza Ranch has everything you’re craving—like delicious pizza, The Country’s Best Chicken®, classic Cactus Bread®, and more! Whether you need a place to watch the next Badgers game or to host your next group event, we’re ready to accommodate. Our endless Buffet Your Way® guarantees you have the best seat in the house and the dining options to match. Stop by after a day at the family aquatic center to refuel. Or, if you’re craving a night in, order online and we’ll deliver. No matter how you dine with us, we have the deals and meals everyone can agree on! Picked up a to-go order chicken, mashed potatoes and biscuits. The best chicken and mashed potatoes around just the right crispness chicken and creamy gravy. Food was good and Fresh. We had a group of 5 and all tables were full. We tried to fit in a booth. We wished that they would of opened the additional seeting as many large groups were looking for seeting. Quick clean up of tables and they were even attentive to make sure the chairs were crumb free. Don’t see that much. Seemed very well managed and was very busy. Clean, good customer service, and delicious buffet. Great stuffed crust pizza. Quick service. I’ve always enjoyed the service here. I called a month earlier and asked if I could secure a room for my grandsons 1st Birthday. The lady said the only stipulation was no wall decor. I told her we’d have 13. Upon arrival, I was told that the fee would be 450.00 to use the room. The hostess relayed messages back and forth to the office. The manager refused to speak with me. We used the room, leaving the door open, in case someone wanted to sit in the room. It was handled very poorly and many of the staff were not friendly. We frequent this location. I’m very disappointed in this visit. 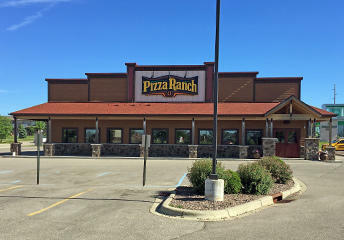 Kiddos always love going to Pizza Ranch and the available options to choose from, thanks!! The food was great as always, I really liked the chicken fries, first time I had them. 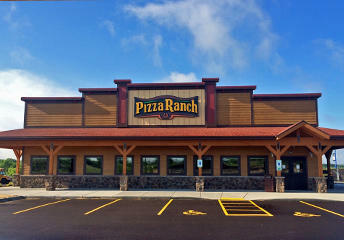 Food always delicious and hot...salad bar is fresh with many options.We always enjoy our visit to Pizza Ranch. Good service. Someone always there to take used plates away. Salad bar didn't seem as fresh as usual. Always disappointed because they never seem to have the chocolate dessert that they’re supposed to have.